Note: Various ships, MICMAC in particular, would have had different weapon and equipment fits at times during their service careers. The above information should be generally correct for the periods given. Some guesswork was involved in the RADAR and SONAR fits listed above, although RADAR fits were based on photographic evidence wherever possible. HAIDA G63/215 30/8/43 11/03/52 11/10/63 Museum in Hamilton, ON. HURON G24/216 19/7/43 1950?? 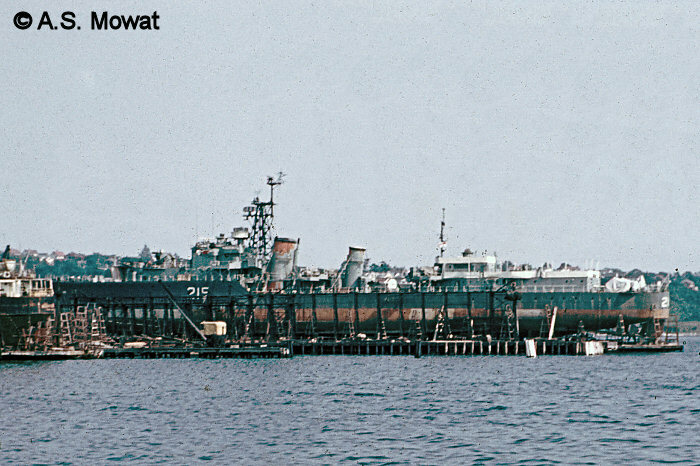 30/4/63 Scrapped at La Spezia, 1965. IROQUOIS G89/217 30/11/42 24/6/49 24/10/62 Scrapped at Bilbao, 1966. NOOTKA R96/213 7/8/46 1950 6/2/64 Scrapped at Faslane, 1965. MICMAC R10/214 12/9/45 1947, 14/8/53 31/3/64 Scrapped at Faslane, 1964. CAYUGA R04/218 20/10/47 1952 27/2/64 Scrapped at Faslane, 1965. ATHABASKAN R79/219 20/1/48 10/54 21/4/66 Scrapped at La Spezia, 1969. All four of these ships saw extensive service in the Second World War. 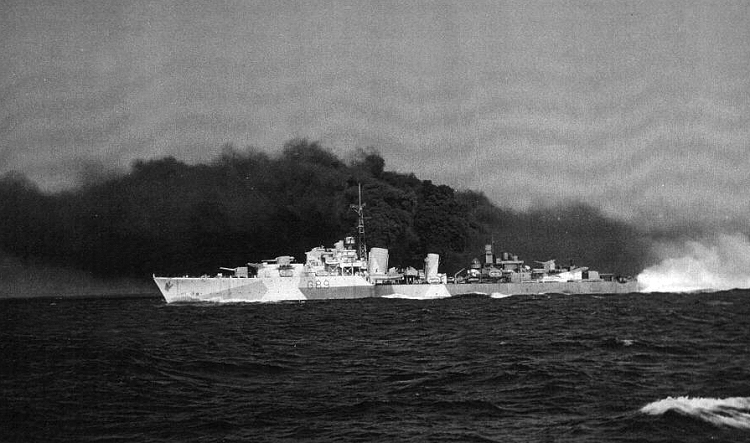 On April 29, 1944, ATHABASKAN was sunk after being hit by several torpedoes, with the outright loss of 128 men. 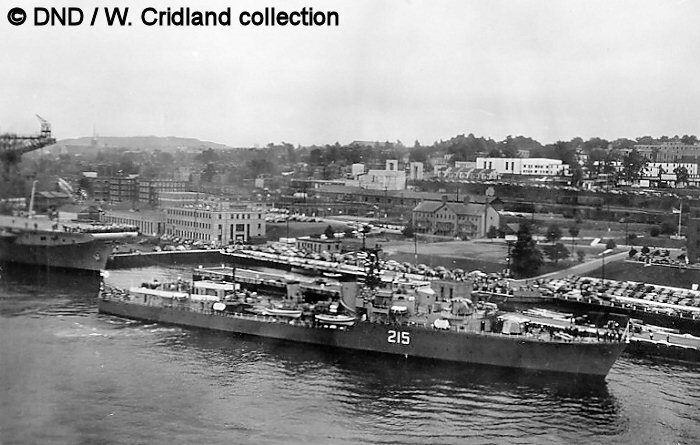 The remaining three were all converted to destroyer escorts (DDE) similiar to the postwar-built Tribals, served in the Korean War, and were paid off in the early-1960s. On August 25, 1964, HAIDA arrived under tow in Toronto to become a floating memorial, and was on display at Ontario Place on the Toronto waterfront until 2002. She was subsequently put into drydock in Port Weller for maintenance, and then towed to Hamilton where she is once again on display. These ships were built as part of the WWII building program, but arrived too late to see WWII service. Unlike the earlier four members of this class, they were built in Canada. 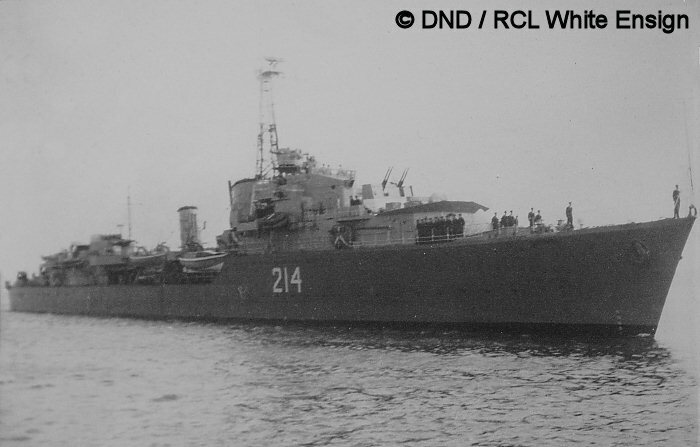 MICMAC and NOOTKA were completed similiar to the original members of the class as DDs, while ATHABASKAN (II) and CAYUGA were built with 4 4"/45 twin mountings instead. 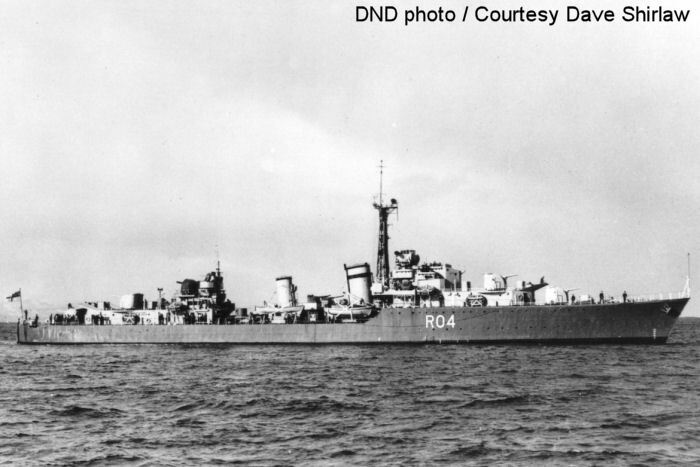 During the late 1940s and early 1950s all four ships were refitted as DDEs. Except for MICMAC, all served several tours of duty in the Korean War; this seems partly due to a collision MICMAC suffered in 1947. 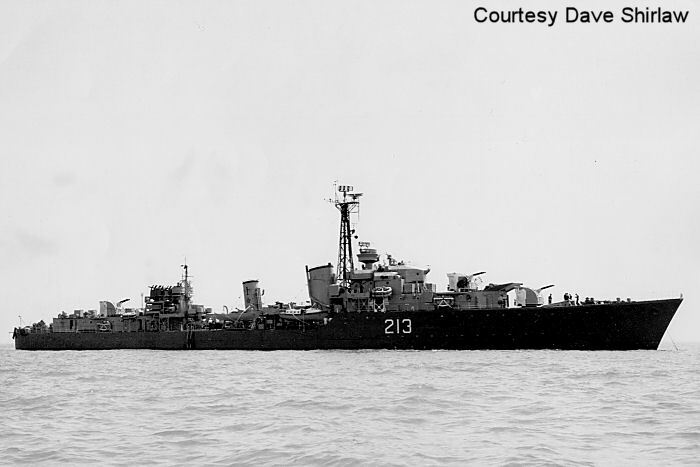 NOOTKA became a DDE before the Korean War, CAYUGA during, and ATHABASKAN (II) after. ATHABASKAN (II) was the second Tribal class ship to bear that name, with ATHABASKAN (I) part of the first batch of ships. 1. 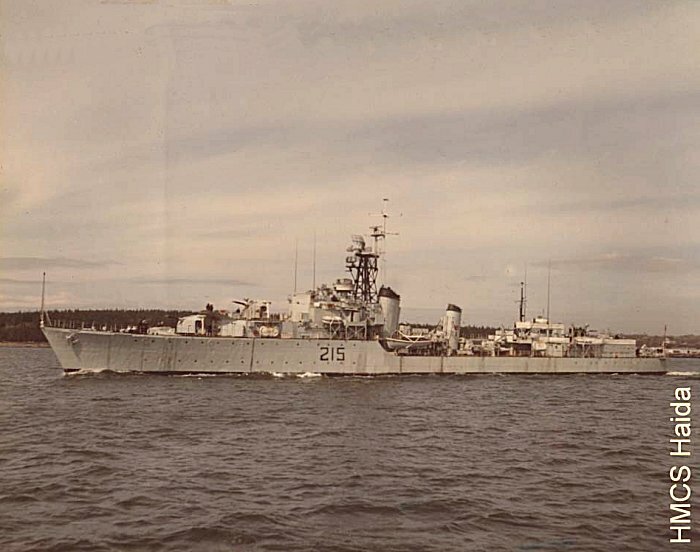 The original HMCS ATHABASKAN. DND photo, courtesy of Royal Canadian Legion "White Ensign" Branch. 1. 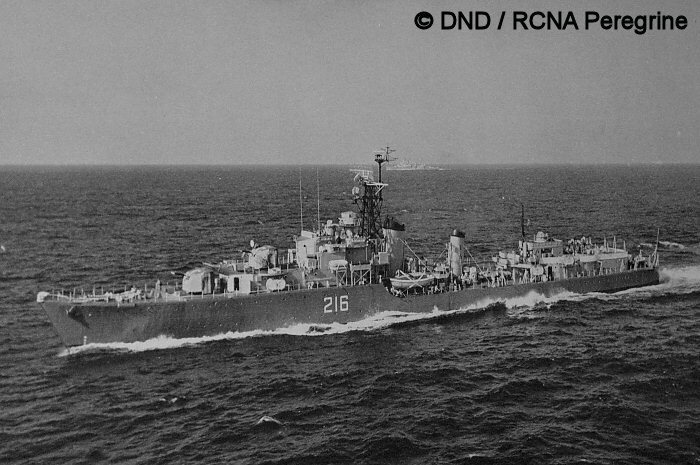 HMCS HAIDA during her first tour of duty in Korea. She has not received her SPS 6 radar. The aft 3"/50 is uncovered in this photo. 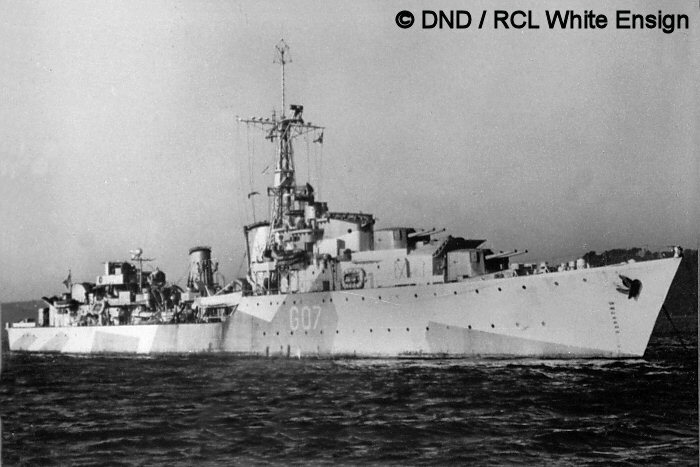 HAIDA saw extensive service in WWII, including duty in the English Channel and convoy duty to Murmansk. She also saw service in the Korean War. DND photo, Courtesy of Bill Croshaw. 2. 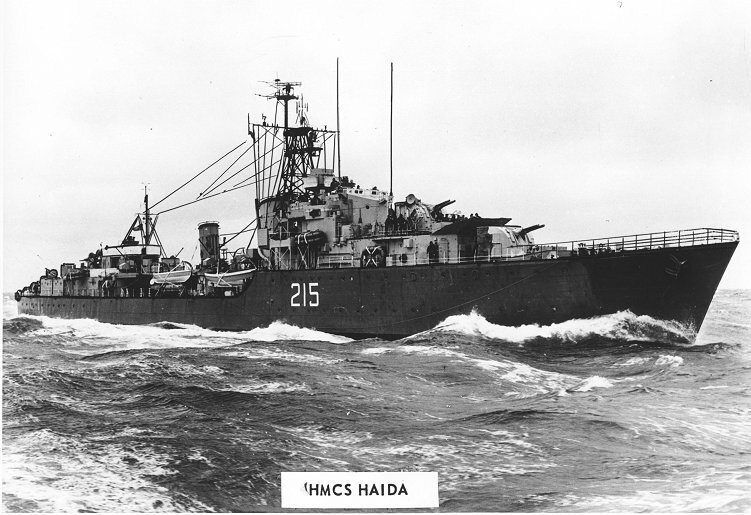 HAIDA after her refit, now with the SPS 6 radar. DND photo, Courtesy of Dave Shirlaw. 3. 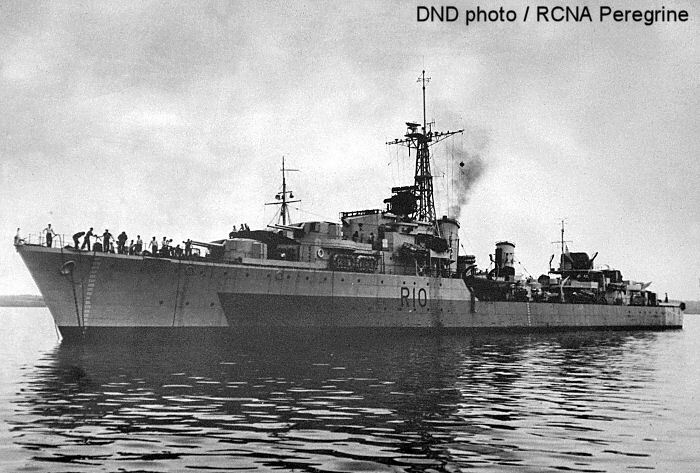 HAIDA after the war, with light lattice mast, but still with the old 4.7" guns forward. 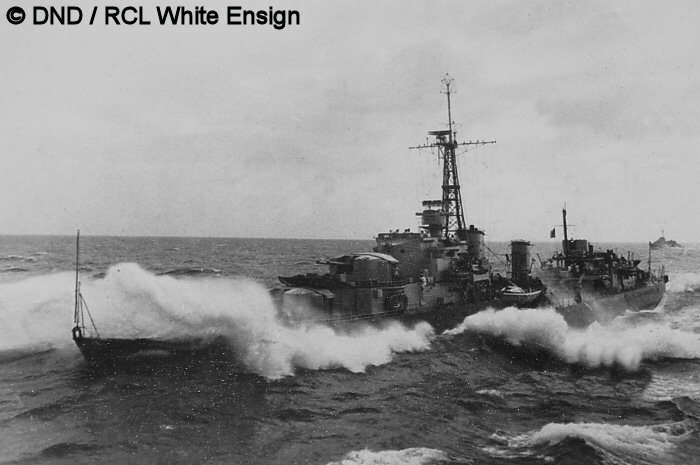 DND photo, Courtesy of Royal Canadian Legion "White Ensign" Branch..
4. 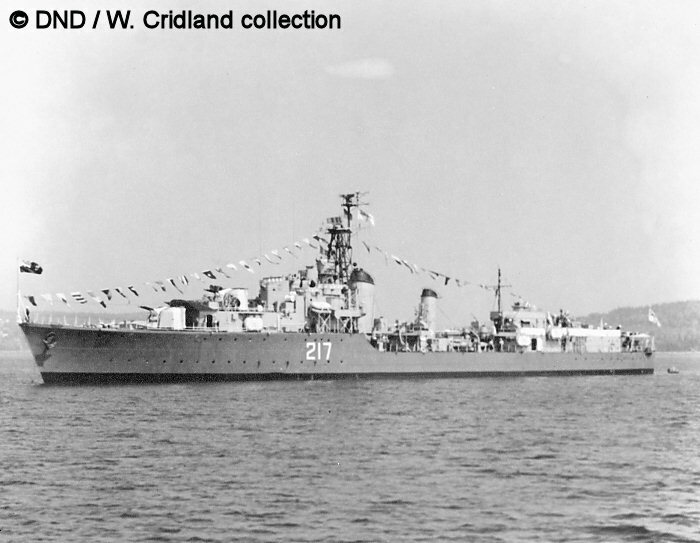 HAIDA in her postwar guise. Courtesy of Bill Dougherty. 5. 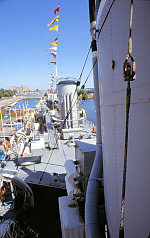 Looking aft from the bow. M.D. Thomas photo. 6. 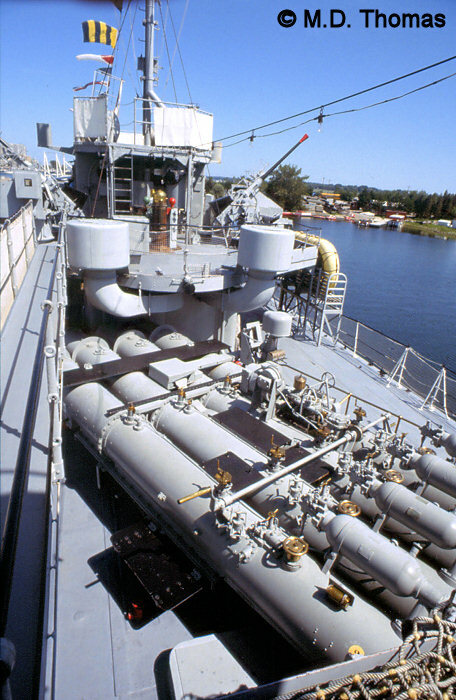 HAIDA's four 21" torpedo tubes, with a 40mm Boffin mounting in the background. The torpedo tubes were rotated to 90 degrees from the ship axis to be fired. M.D. Thomas photo. 7. Looking aft from ajacent the forward funnel. The forward port 40mm Boffin mounting is visible. M.D. Thomas photo. 8. Looking aft from just forward of the forward funnel. M.D. Thomas photo. 9. The bridge. M.D. Thomas photo. 10. 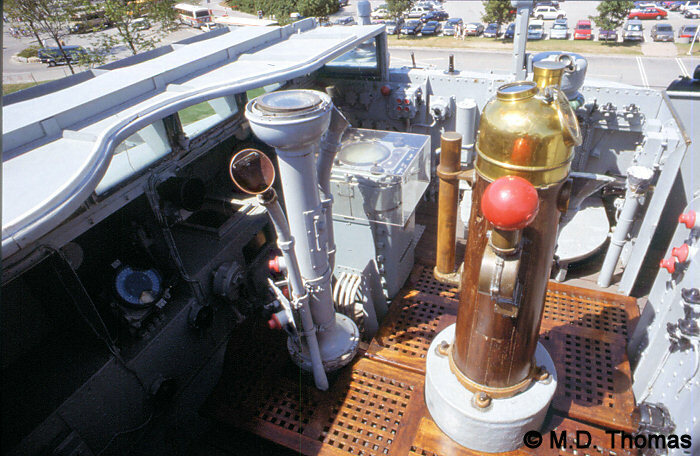 A 4"/45 Mk.16 twin gun mounting, in this case "A" mounting. 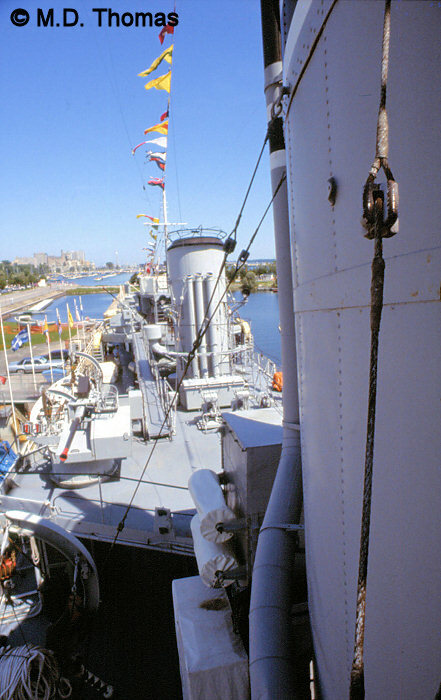 This type of twin mounting was located in "X" position when HAIDA was built, and this mounting later replaced the 4.7" twin mountings in "A" and "B" position during refits in the early 1950s. 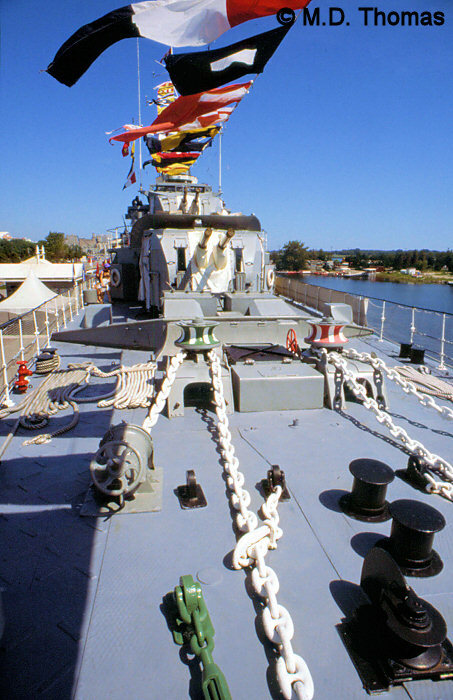 The 4"/45 Mk.16 twin mounting was replaced in "X" position with the 3"/50 mounting. M.D. Thomas photo. 11. HAIDA alongside in Halifax Harbour. 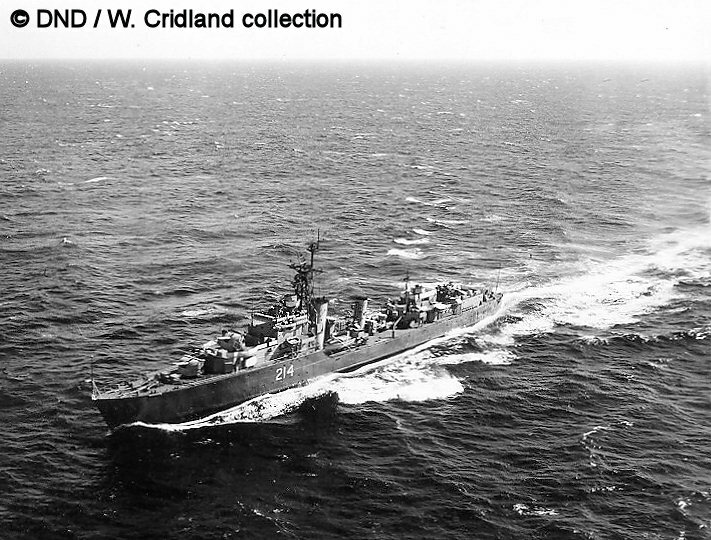 DND photo / W. Cridland collection. 12. HAIDA undergoing a refit on the Dartmouth Marine Slips in Halifax Harbour. A.S. Mowat photo. 13. HAIDA leaves Toronto bound for Hamilton. Darren Scannell photo. 14. HAIDA leaves Toronto bound for Hamilton. Darren Scannell photo. 1. 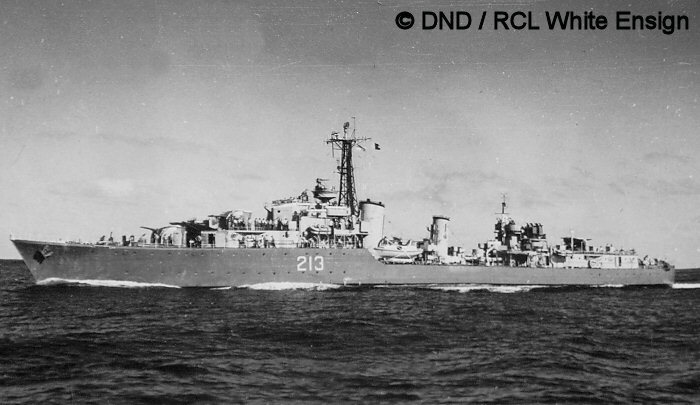 HURON underway, refitted as a DDE. This was likely taken before the late 1950s. DND photo, courtesy of RCNA Peregrine. 1. IROQUOIS laying smoke. This was a tactic used before radar became as prevalent as it is today, to obscure the position of friendly forces from the enemy. DND photo, courtesy of Bryan Q. 2. IROQUOIS either late-war or immediately post-war. She was built with a tripod mast, but is shown here with a new lattice mast. DND photo, courtesy of Bryan Q. 3. 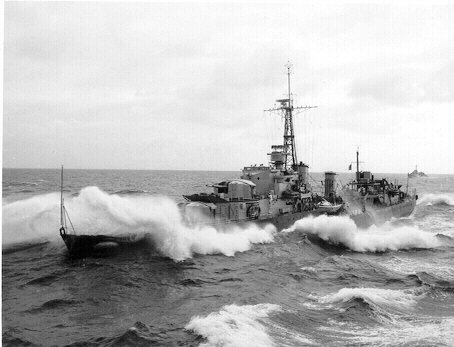 HMCS IROQUOIS making her way through a wave. She is shown after all her major refits were carried out, with her new mast and guns fitted, and the aft 3"/50 has the gunshield. Courtesy of Bill Dougherty. 4. 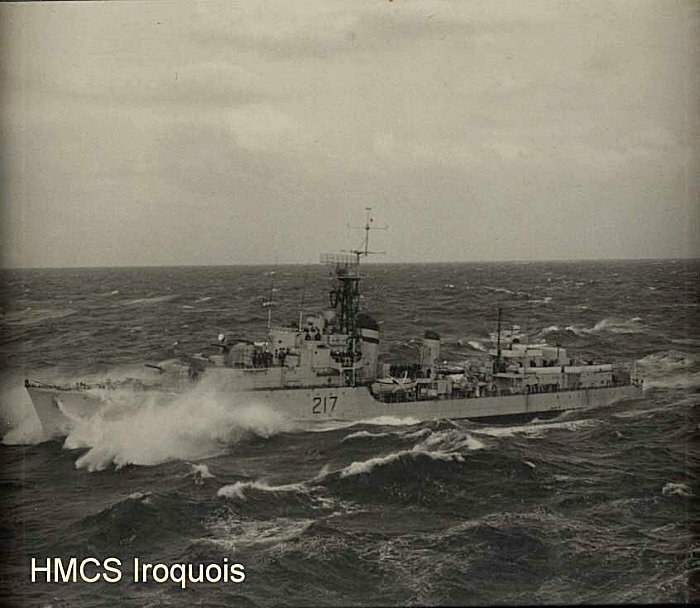 IROQUOIS postwar. 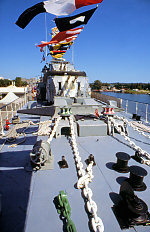 This shows her final appearance, except for the missing gun shield on the 3"/50 mounting aft. 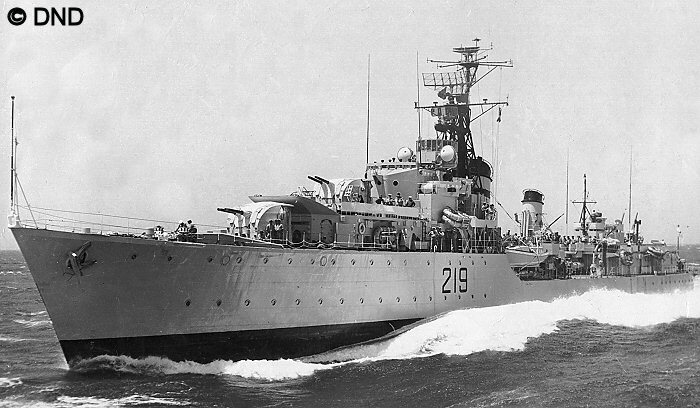 Her Type 293 radar has been removed. DND photo, W. Cridland collection. 5. IROQUOIS postwar. Although she has been refitted to the DDE configuration, she has not yet received the SPS 6C radar, and the Sperry navigation radar seems to be mounted in its place. DND photo, W. Cridland collection. 6. IROQUOIS during the war. This is pretty much how she would have appeared when built. DND photo, courtesy of B. Lake. 1. NOOTKA in a state of refit flux; unusually, she has three 4"/45 mounts, with a Squid in Y position right aft. 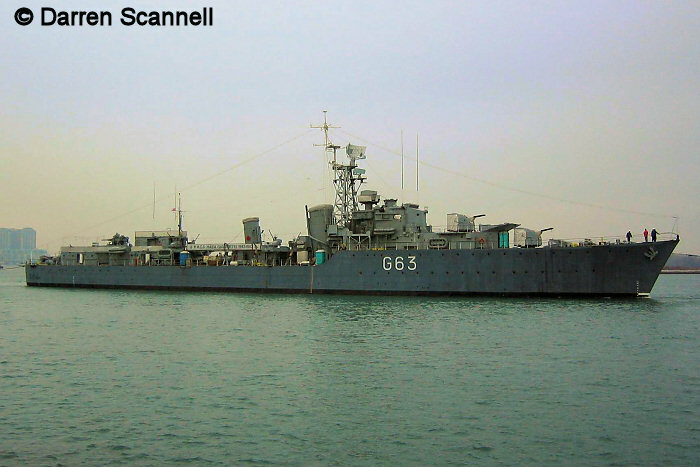 She has not yet received the new heavier lattice mast, but still mounts the Type 285 fire control radar on her director. 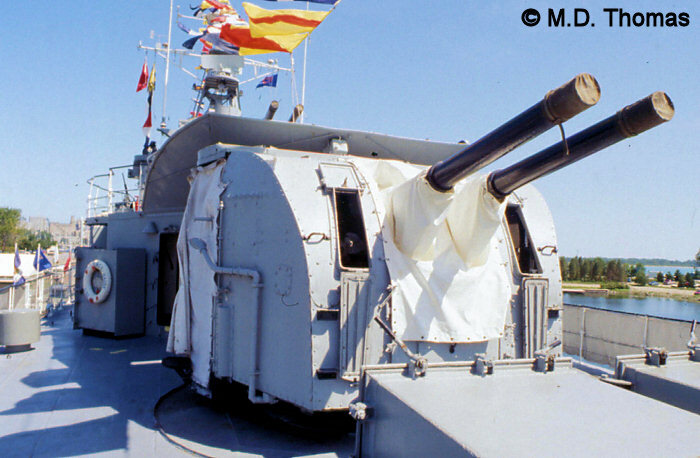 The 40mm Bofors Mk.5 twin mounting is visible just forward of X position. Photo courtesy of Dave Shirlaw. 2. NOOTKA. 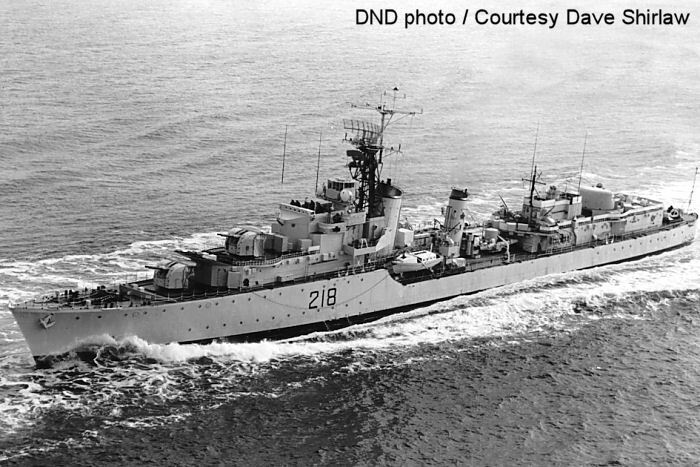 DND photo, courtesy of Royal Canadian Legion - White Ensign Branch. 1. MICMAC, as built, at high speed. DND photo, courtesy of RCNA Peregrine. 2. As in the last photo, MICMAC appears as she was built, and wearing her original pennant number. 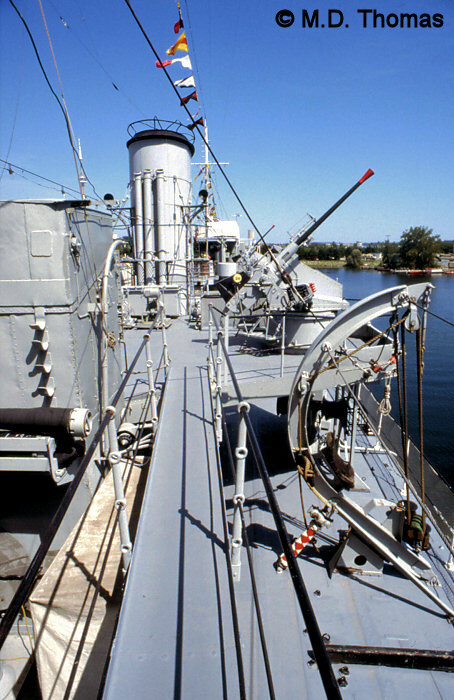 Forward are the original two 4.7" twin mounts. DND photo, courtesy of RCNA Peregrine. 3. MICMAC at sea, now with two 4" twin mounts forward. DND photo, W. Cridland collection, courtesy of Bonnie McIssac. 4. MICMAC at sea. DND photo, W. Cridland collection, courtesy of Bonnie McIssac. 5. 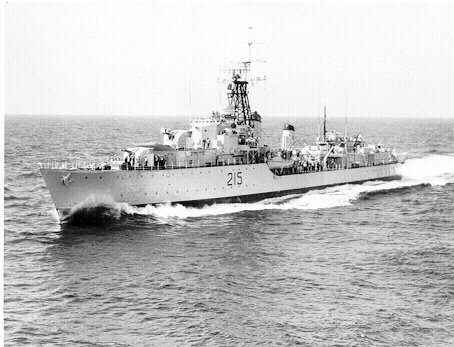 MICMAC after her collision, with a quad 40mm Bofors AA mounting in "B" position, and no gun mounted in "A" position. This mounting was later replaced with the 4"/45 mounting found on her sisters in this position. 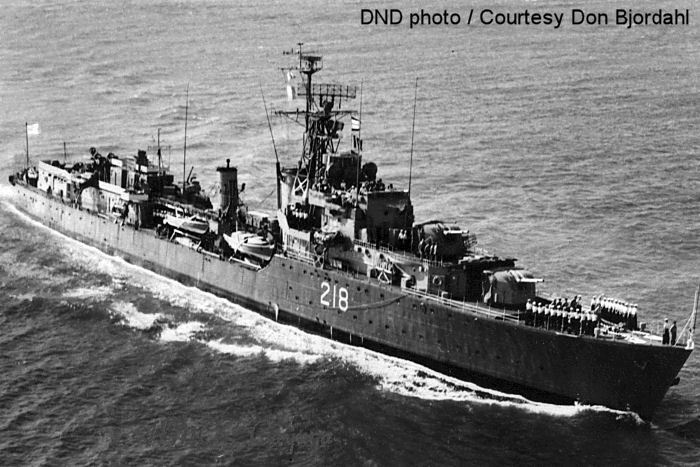 DND photo, courtesy of Royal Canadian Legion - White Ensign Branch. 1. CAYUGA in her close to her final form, with two 4"/45 twin mounts forward, and the 3"/50 mount (without the fibreglass shield) in X position aft, and a Squid launcher in Y position aft. The SPS 6 antenna is the big radar on the mast, with the Type 293 above and the Sperry navigation antenna below. DND photo, courtesy of Don Bjordahl. 2. 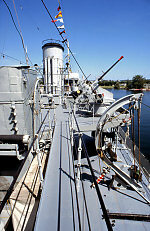 CAYUGA sports the gun shield on her 3"/50 gun in this photo. What is probably the SPG 34 dish is just visible on the 3"/50 gunshield. The Mk.6 director with the two Type 275 trackers is visible just forward of the mast. DND photo, courtesy of Dave Shirlaw. 3. CAYUGA as built, with all four 4"/45 gun mounts. DND photo, courtesy of Dave Shirlaw. 1. 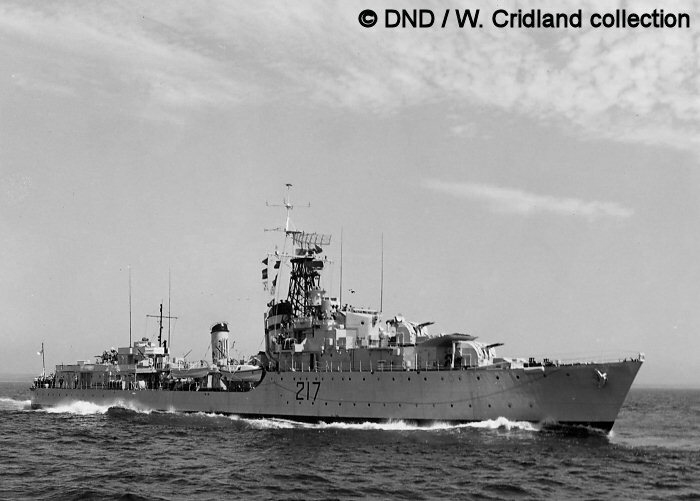 Acting as flotilla leader, HMCS ATHABASKAN (2nd) does not bear a pendant number. She appears pretty much as built, and has not yet received the new heavier lattice mast. DND photo. 2. 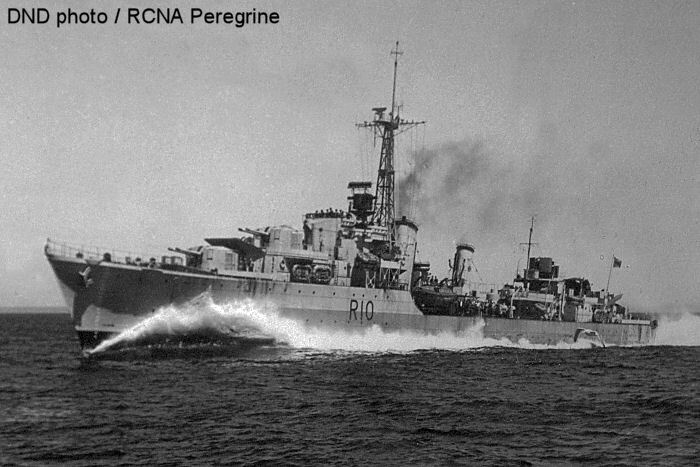 ATHABASKAN at sea in a similar state as the first photo, but with a new Sperry navigation radar fitted to the mast-head. DND photo, courtesy of RCNA Peregrine. 3. ATHABASKAN in her final configuration as a DDE. DND photo, courtesy of B. Lake. Barrie, Ron and Macpherson, Ken. (2002). 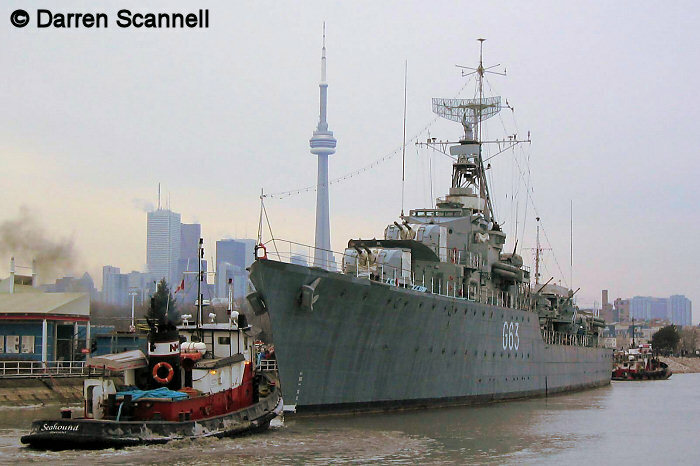 This Ships of Canada's Naval Forces 1910-2002. Vanwell Publishing Ltd. St. Catherines, Ont. Gough, Barry M. (2001). 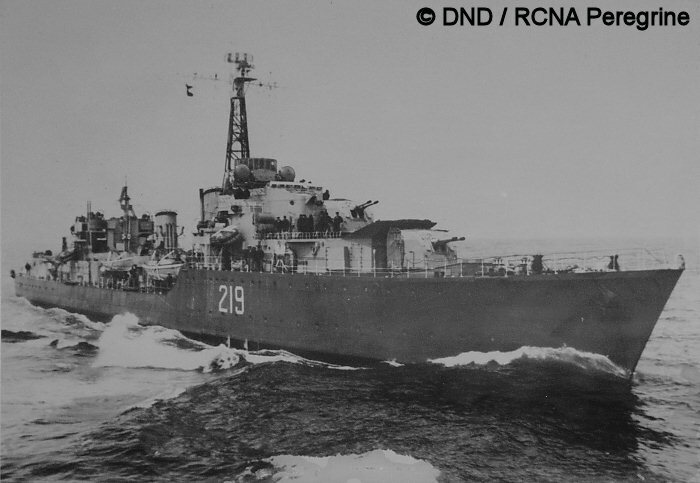 HMCS HAIDA - Battle Ensign Flying . Vanwell Publishing Ltd. St. Catherines, ON. Steed, Roger G. (1999). 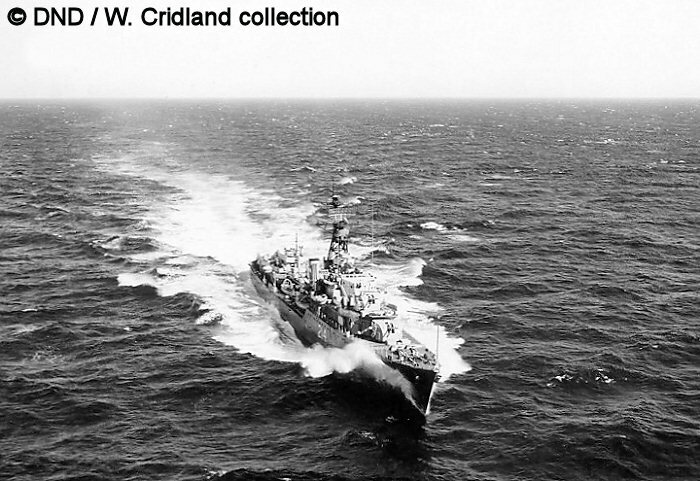 Canadian Warships Since 1956. Vanwell Publishing Ltd. St. Catherines, ON. With information from the files of Mike Potter and Jerry Proc. ASDIC, RADAR, and IFF Systems Aboard HMCS HAIDA website by Jerry Proc. Correspondence with B. Lake and R. Barrie. Copyright © 1997-2006, Sandy McClearn. All Rights Reserved.